Butterfly Threads: Old Money for free! I'm in the give away mood now that the Blog Hop Party Give Away is in full swing! It's fun to see all the neat things folks are offering and the excitment of those entering (myself included). So I've decided to give away a free pattern that is one of my all time favorites. The name of it is OLD MONEY (sorry if you thought cash was involved...hate to disappoint, but it's just a pattern) because the traditional name for this setting is "coins" or "chinese coins" or "stacked coins" and I used Civil War reproduction fabrics that I aquired in a fabric swap a few years ago. Okay, so maybe it's a stretch, but in my mind, I thought it was clever! It's super simple and chances are you could make it from the photo alone, but for those who like to have the numbers in front of them, here it is. Sew the coins into 6 rows of 45 each. Sew rows of coins and sashing side by side referring to the photo. Sew the top and bottom sashing to the top and bottom. Sew the side borders on, and press toward the borders. Sew the top and bottom borders on, and press toward the borders. Layer the quilt top, batting and backing and baste. Quilt as desired. This quilt has an all over pattern by machine. You will have enough border fabric left for binding. Enjoy! 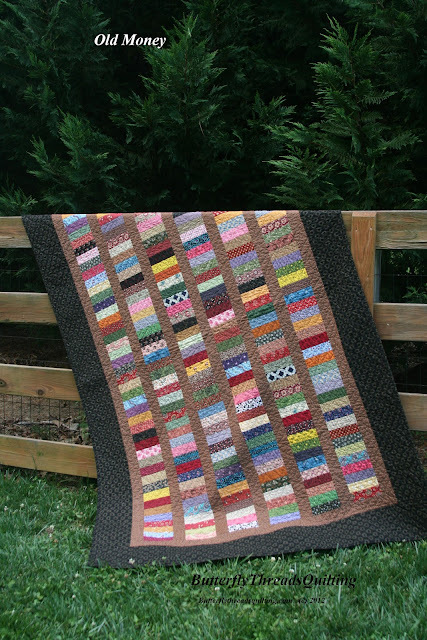 I would love to try this quilt and I am one that needs the numbers in front of me. Thanks for sharing. I love this quilt and have just the fabric for the coins. I have been looking for something to make with the 1" scraps I sewed together into one big piece. This is it. Thanks!!!! How about using clothing from a loved one who has gone to heaven???!!!! Love this!! Lovely and easy, my two favorite things in quilts. I have a bunch of 5 1/2" x 2 1/2" strips that I have been pondering how to turn into a quilt. Now I have the answer! Thanks! Thanks for sharing. Enjoying your posts.